You are browsing the archive for cartoon exhibition. 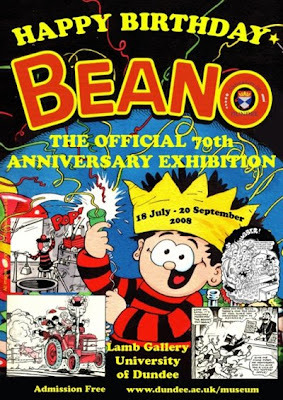 Amid the coverage of the London launch of the Beano and Dandy Birthday Bash last week at the Cartoon Museum, we should mention that there’s a parallel exhibition in the Beano and Dandy’s home town of Dundee. The exhibition is being held at the Lamb Gallery at the University of Dundee until the 20th September, Monday to Friday 9.30-20.30, Sat 9.30-12.00, and best of all, it’s free to enter! More details at the University of Dundee’s website. Not being able to attend ourselves, Bloghorn would be keen to hear any reports from the exhibition. Getting back to the London event, ITN sent a reporter along to cover the event last week, and here’s their report. Thanks to Lew Stringer for his Blimey! It’s another blog about comics for the above links. PCO member Steve Bright, who worked for the comics for more than twenty years, asks us to point out that ITN have made a clanger in their copy. The current editor of The Beano is Alan Digby, not Rigby. Independent Television News, what can you say … thanks for pointing that out Steve. 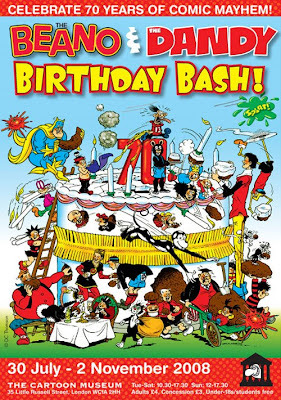 The Beano and Dandy Birthday Bash exhibition opens today at the Cartoon Museum in London. PCOer Royston Robertson writes: I attended the preview of the show last night and can report that, as you would expect, it’s great fun. For the cartoonist geeks among us it’s a chance to peer up close at original artwork drawn by some of the much-loved masters of comic art, such as Ken Reid and Dudley Watkins. But there’s plenty for the younger comic readers too, including activities and quizzes. Can you name all nine Bash Street Kids? The exhibition spans eight decades and takes in all the Beano and Dandy characters you’d expect to see, from the iconic figureheads of Dennis the Menace and Desperate Dan to much-loved characters from the past such as Brassneck, Winker Watson and Pansy Potter (The Strongman’s Daughter, of course). I’ll certainly be returning with my kids, and I suggest that anyone with a love of British comics puts it on their must-see list for the summer and autumn. The exhibition runs until November 2. While we’re busy marking 60 years of the NHS this week, let’s not forget that another much-cherished British institution has a significant birthday approaching. 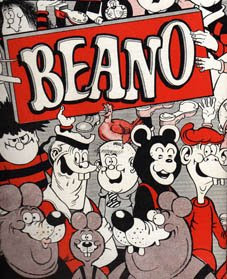 On July 30, The Beano will be 70 years old. London’s Cartoon Museum will be holding a major Beano and Dandy exhibition to celebrate. It will run until November 2 and will feature Dennis the Menace, the Bash Street Kids, Minnie the Minx, Lord Snooty, and all the gang. More on this nearer the time. 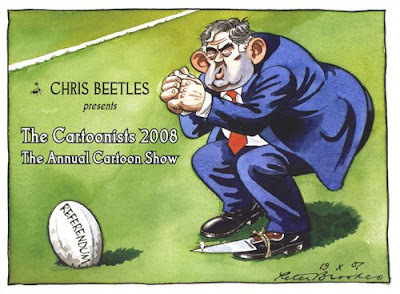 An exhibition entitled Cartoonists 2008 opens at the Chris Beetles Gallery in London on April 8 and runs until May 3. It is the gallery’s second annual show devoted to the art of British cartooning, following on from its successful You Havin’ a Laugh? exhibition last year. 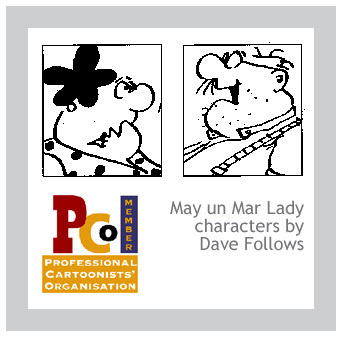 The show features cartoonists from publications such as The Times, The Sunday Times, Private Eye, The Spectator, Daily Express, London Evening Standard, the Telegraph and The Economist, and includes PCO members Andy Davey, John Jensen, Royston Robertson, Kipper Williams, and Mike Williams. Original artwork is on sale, at prices ranging from £50 to £5,000. The gallery, at 8 & 10 Ryder Street, St James’s, London, is open from 10am-5.30pm, Monday to Saturday. Tel 020-7839 7551, email gallery@chrisbeetles.com or visit the website.